Imagine the movement of a salmon fly if the salmon fisher holding the fly rod was Maradona, Pele, Johnstone or Jairzinho! Just how tantalising would that fly performance be in the stream to a resident salmon that's been 'bored to death' with the normal systematic & tedious fly swim tactics. To catch salmon when the going is tough you need to inject a bit of thought and 'life' into your salmon fly as what truly matters in this business is only what the salmon are seeing! Start this thought process off by thinking about the materials that are built into your salmon fly. Are they stiff and rigid targeting only the easy fish that would take a 'fluttering' bottle top or are these salmon fly materials soft with natural movement with self pulsing 'waggling' brilliance to trick an 'educated' resident salmon into thinking the fly is a real 'alive' creature! There's only one way to find out with a salmon fly and that's by swimming it at the edge of the river before you fish with it and studying its behaviour closely. If it's not got a beautiful natural movement of it's own then throw it in the bin! The big thing I've noticed with many salmon fly fishers is that after their forward delivery cast is made most of them switch off all thoughts of what their salmon fly is doing! This 'launch & hope' tactic will occasionally get a result if there's a keen fish in the pool but as far as the more 'difficult to coax' older resident fish go that angler has no chance. To separate your salmon fly from the mundane boring salmon flies salmon see on a daily basis you must 'mentally' tuned in and be able to visualise your salmon fly's swim behaviour all the way back across to your side of the river. Once you reverse the sleeping pattern of your mind to 'switch on' to the fly swing and 'switch off' to the repetitive casting side of things then here's a few tips to make you the 'King' of the salmon pool and give you the power to force a salmon to take! Make the tip section of your fly rod into an orchestra conductor's baton and use it the same way! A salmon will respond far better to something that's completely unpredictable especially if it has magnificent movement when it sags and darts on it's swim path back to your side of the river creating a true life like 'nuisance' that needs investigated or assassinated! Get right into the habit of not leaving your fly alone for anymore than 5 seconds throughout the swing and keep varying the lengths of flicks, draws, shudders and nudges you're giving it. Don't allow those resident salmon to take their eyes off your fly for one minute and keep going at your preselected depth and riverbank movement spacings all the way to the tail of the pool. If you're in any doubt as to how much movement you're applying to the fly then ask a fishing pal to apply these variable movements to your fly rod from an upstream position while watching from a vantage point so you can get an exact visual on what's going on below the water line. If you follow the above you'll soon see the irrelevance of the perfectly delivered Spey cast by comparison to what you're now making happen under the waterline. 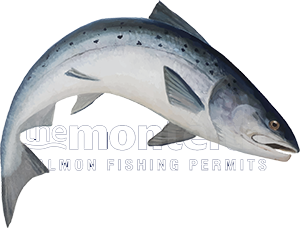 In addition to that you'll experience way more knocks, dunts, bangs and good solid takes from salmon when other anglers are convinced there are no fish in the pool. Taking a degree in Atlantic salmon psychology is the most important aspect of this fascinating pursuit and that 'prioritisation' starts from the fly all the way back along your fly line and down through the rod rings right through to the studs on your wader boots and never the other way around!